How do you realize 400 different counters from design to installation for a new airport terminal in Algeria in less than half a year? INTOS knows how! Curious how this project is being picked up? We are happy to give you a glimpse. 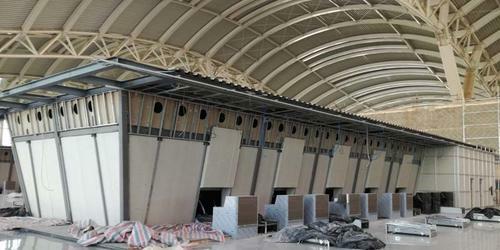 In Algeria a new terminal, called T-3, is being built for Houari Boumedienne airport in Algiers. The terminal will be taken into use mid-2018. For this prestigious project, one of the biggest airport projects of Africa in the last couple of years, the Chinese contractor CSCEC was searching for a reliable interior supplier. CSCEC came into contact with INTOS through the Passenger Terminal Expo in Cologne in 2017. Seven different counter types had to be designed, developed, produced and installed. For these counters, a good price-quality ratio was important. But they also had to be sustainable and modular, so that parts can be replaced in the long term and they can easily be built up by local installers. Of course, the delivery time also played an important role! Based on a standard counter solution from the INTOS assortment, INTOS created in close contact with the contractor and the airport authority a customized counter design that fully matched their needs. After an extensive engineering and sampling process, the final design was a fact. This design has been applied to all counter types from check-in counters to passport, transfer, boarding, ticket, information and airline desks. Resulting in an overall uniformity of the terminal. Then it was time to start the production. In just 3 months INTOS was able to make all 400 counters. All counters were shipped in different containers over sea to the Port of Algiers. Once the construction works were set on-site all check-in and passport counters were installed. The other desks will be placed in the upcoming months, partly under the supervision of two INTOS specialists. To be continued!